Construction is a very unique Artisan skill which allows you, the player the opportunity to build your very own house! Aside from becoming the owner of your very own house, you can also make various runescape gold which you can sell to other players. Aside from the benefits from having your house, butler and carpentry skills, you are able to store various items and outfits allowing you to free up some bank space You can also hold parties for your friends (or enemies!) or allow them into your dungeon for a bit of fun. Not only that, but Construction is beneficial to various other skills, giving you the ability to offer your bones at Player-owned Gilded altars for Prayer training, or taking your damaged armour to the Workshop to be repaired. 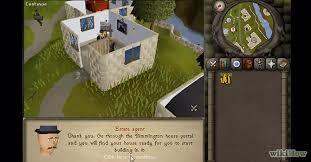 Once you have finally reached level 99 in the skill, you can travel to the Estate Agent and purchase the Construction Skillcape for 99,000 rs gold. You can do this at the Estate Agents located in Varrock, East Ardougne, Falador and Seers’ Village. This will enable you to use a boost that raises your Construction level to 100 and also allows you to perform the Construction Skillcape Emote. The cape itself is members only. However, free players can still perform the emote granted they are wearing the cape. If Construction is your first skill to reach level 99, you will be rewarded the Construction cape. However, if you have other skills at level 99, you will be awarded the Construction cape (t). If you have the untrimmed version of the cape and achieve level 99 in another skill, the cape will become trimmed automatically. The only way to keep a copy of the untrimmed cape is to use a keepsake box from Solomon’s General Store.